On November 19th, the workshop “Information & Communication Technologies in Horizon 2020” took place in Athens. On December 9th, the workshop “Program of the European Research Council for Horizon 2020, about Research & Innovation in European Union” took place in Athens. National Documentation Centre of Greece organized several sessions for promoting Horizon 2020 and helping businesses to understand the funding opportunities and challenges arising from the Horizon 2020. This was a major opportunity for companies to expand their network and disseminate their projects and for future cooperation. Every company interested in participating in Horizon 2020 projects, with vision for the future, participated in this workshop. 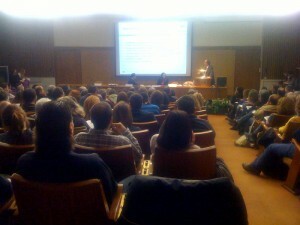 More than 300 representatives from companies all over Greece were in the National Documentation Centre. EPSILON International SA participated in these two events. Its representatives Mr. Alkis Astyakopoulos and Mr Marc Bonazountas disseminated the smeSpire project presenting project objectives/initiatives to various ICT and Geo-ICT SMEs, to subscribe in the Network database. For this purpose, they also distributed smeSpire material.